Welcoming HH Bhakti Vasudeva Swami to Toronto's Hare Krishna Centre! ~ The Toronto Hare Krishna Temple! Welcoming HH Bhakti Vasudeva Swami to Toronto's Hare Krishna Centre! Toronto's Hare Krishna community is happy to announce that we will be welcoming HH Bhakti Vasudeva Swami for first time to our city! 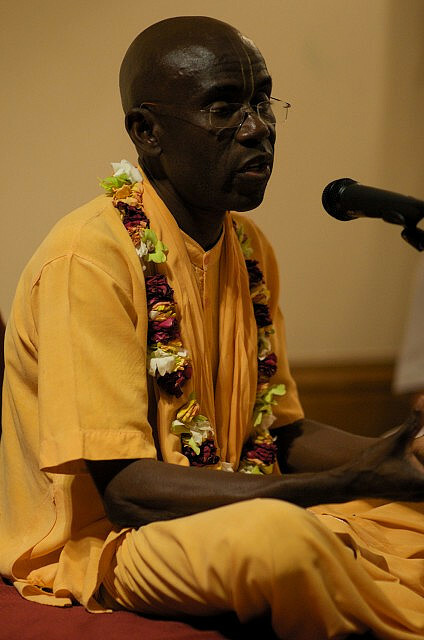 Maharaj will be joining us until Monday and will be here for our Govardhana Puja, Srila Prabhupada Disappearance Day and Sunday Diwali celebrations! He will also be conducting some morning classes. Bhakti Vasudeva Swami, a disciple of HH Bhakti Tirtha Swami, has a master degree in philosophy and education with measure in critical and creative thinking and caring community of enquiry. His work is based out of an African institute affiliated to Montclair State University in New Jersey - USA where he will finish his PHD soon. His guru wanted him to be amongst scholars and pundits, sharing our spiritual culture in the best way and giving Krishna consciousness in the highest level possible to show academics and scholars of the beauty of our philosophy. Jaya!!! Really enjoyed His Govardhana Puja class. Looking forward to hear more! Hare Krishna! PAMHO, AGTSP! I was wondering if it could be made possible to download the classes from Ustream? It seems the website indicates the video download option is only available to the account owner of the video. I'd especially like to download HH Bhakti Vasudeva Swami Maharaja's classes :-) Thank you. Hari Bolo. Your servant.